Growing up in New Zealand, Keisha Castle-Hughes dreamed of someday becoming an actress, though she suspected that achieving such a goal would be extremely difficult. In 2001, when Castle-Hughes was just eleven years old, a casting director visited her school searching for a young girl to play the lead role in an upcoming movie. In a fairy-tale-like scenario, Castle-Hughes was awarded the role, chosen from among hundreds of children to play Pai, the main character in Whale Rider. Just three years later, in February of 2004, she found herself seated in one of the front rows of the Kodak Theatre in Los Angeles, California, at the seventy-sixth annual Academy Awards ceremony. Castle-Hughes was no ordinary attendee, however: she arrived at the ceremony as a history-making performer, the youngest ever to earn a nomination for best actress. Castle-Hughes was born on March 24, 1990, in Donnybrook, Western Australia. Her father, Tim Castle, is Australian, while her mother, Desrae Hughes, is a Maori from New Zealand. The Maori, a people of Polynesian descent, were the first to populate New Zealand, possibly as long ago as 800 C.E. When Castle-Hughes was four years old, she and her family moved to New Zealand, a nation consisting primarily of two large islands, the North Island and the South Island. She now lives on the North Island in Glenn Innes, near Auckland, New Zealand's largest city. Castle-Hughes has two younger brothers, Rhys and Liam. "A long time ago, my ancestor Paikea came to this place on the back of a whale. Since then, in every generation of my family, the first-born son has carried his name and become the leader of our tribe ... until now." Prior to being cast in Whale Rider, Castle-Hughes had experienced a typical childhood, attending school, arguing with her brothers over whose turn it was to wash the dishes, and spending time with friends. She told Eleanor Black of the New Zealand Herald, "I'm always on the phone. When I'm not with a friend, I'm on the phone to a friend and when I'm not on the phone to a friend, I'm on the net to a friend, so I'm always with friends." She had wanted to become an actress one day, although she had been warned this was a difficult path. Upon expressing her theatrical ambitions during a career fair at her school, she was advised to seek a more "realistic" profession. According to an article in Entertainment Weekly, she recalled, "I always said I wanted to be an actor and people were like, 'It's not going to happen. It's a great dream, but let's get real here.'" When director Niki Caro and casting director Diana Rowan visited her school in Mt. Wellington in 2001, Castle-Hughes had no way of knowing the impact that visit would have on her life. Nearly ten years earlier, Rowan had discovered Anna Paquin, also a Kiwi, or New Zealander, and cast her in the Oscar-winning film The Piano. Paquin won an Academy Award for best supporting actress in that film and has gone on to star in several successful films, including the X-Men series. Just as she had done with Paquin, Rowan detected untapped acting potential in Castle-Hughes, and the eleven-year-old was chosen to star as Paikea in Caro's upcoming film Whale Rider. In her biography on the official Web site for Whale Rider, Castle-Hughes recalled her reaction when she learned she had gotten the role of Pai: "I was just speechless, I didn't know what to say. About two hours later I was running around the hotel just screaming. I was so overwhelmed!" The screenplay for the movie Whale Rider, adapted for film by director Niki Caro, was based on a novel by Witi Ihimaera. Born in Gisborne, New Zealand, in 1944, Ihimaera has been credited with writing the first Maori novel— Tangi, released in 1973. Best known for his works written for adults, Ihimaera has also published books for a younger audience, including his young-adult novel Whale Rider. The film's success brought the author, already celebrated in his native land, significant exposure worldwide. Like the film, the novel focuses on a young girl, though her name in the book is Kahu rather than Pai. The chapters alternate between narration of the girl's story by her uncle, Rawiri, and an account of the legendary whale rider, founder of the Maori people. As with her film counterpart, Kahu displays the qualities of a natural leader, but she meets with anger and resistance on the part of her great-grandfather, who cannot accept the idea of a female tribal chief. Supported and loved by her less-traditional great-grandmother, Nanny Flowers, Kahu develops the confidence to challenge her tribe's ancient conventions. (In the film these characters are the girl's grandparents rather than great-grandparents.) In a review of the novel in Booklist, Gillian Engberg described it as a challenging work because of its multiple story lines and difficult subject matter, but asserted that the book is well worth the effort: "[Ihimaera] combines breathtaking, poetic imagery, hilarious family dialogue, and scenes that beautifully juxtapose contemporary and ancient culture." Castle-Hughes spent about two months filming Whale Rider in Whangara, a small seaside village on the eastern coast of New Zealand. With the help of her tutor, Stephanie Wilkin, and director Caro, Castle-Hughes received a crash course in acting, learning the basics of her craft and getting to know the character she would play. Castle-Hughes recalled at the film's Web site: "Stef and Niki showed me how to find my feelings and how to talk properly. Then after a couple of weeks I just fell into the character. I didn't need to look back on anything because I could feel the character so much." She earned praise from the filmmakers and her fellow actors for her dedication, her professionalism, and her ability to portray complex emotions in a believable way. Based on a book by Maori author Witi Ihimaera, Whale Rider depicts a crisis in the world of a Maori tribe known as Ngati Kanohi. The tribal elders struggle to make their ancient traditions relevant to the young people in the tribe, many of whom feel a strong attraction to the values and popular culture of Western society. The leader of the tribe, Koro, finds himself in a difficult position: tribal tradition dictates that the leader be a first-born male descendant of the legendary Paikea, who arrived at the shores of New Zealand one thousand years ago on the back of a whale. But a tragedy in Koro's family has undermined that tradition: while in labor delivering her twin daughter and son, Koro's daughter-in-law dies, as does the baby boy. The grief-stricken father, Koro's son Porourangi, names his daughter Paikea, breaking with tradition by giving a girl the name of the male tribal ancestor. Koro, desperately worried about the tribe's future now that the male heir has died, urges his son to quickly remarry and produce a male heir. Pourarangi responds by fleeing New Zealand, leaving his daughter to be raised by her grandparents. 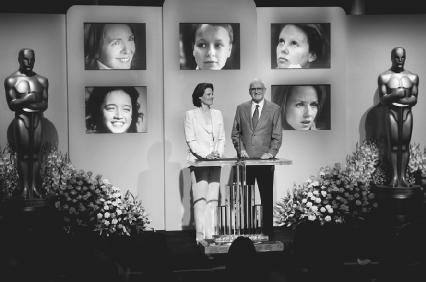 Actress Sigourney Weaver and Academy president Frank Pierson announce the nominees for the 2004 best leading actress Oscar. Pictured on the screen behind them, from lower left: Keisha Castle-Hughes, Diane Keaton, Samantha Morton, Charlize Theron, and Naomi Watts. somehow remains steadfast in her belief that she is destined to lead her tribe and that her grandfather will eventually recognize that fact. When several whales are stranded on Whangara's beach, many in the community interpret the situation as a dire warning for the tribe itself. They consider the whales sacred, and if the beached whales die, it would seem to forecast more trouble for the Ngati Kanohi people. The entire town bands together in an effort to get the whales back into the water, but their efforts are unsuccessful. In an extraordinary display of courage and leadership, Pai goes to the beach alone, climbs on the back of one of the whales and, like her legendary namesake, rides the whale through the ocean water. Whale Rider, a small movie from the distant country of New Zealand that starred native actors as well as non-actors who had never before been in a film, achieved a surprising level of success in the United States, Europe, and elsewhere. The film earned more than $40 million at box offices worldwide, a respectable sum for any movie and a shocking amount for a film made well outside the Hollywood mainstream, with a budget of about $4 million. Whale Rider won audience awards at such important festivals as the Toronto Film Festival in Ontario, Canada, and the Sundance Film Festival in the United States. At the New Zealand film awards the film won honors for best film, writer, and director, with Castle-Hughes taking home the trophy for best actress. Of her many awards and accomplishments, Castle-Hughes's Academy Award nomination for best actress earned her the most attention worldwide. The youngest-ever nominee lost to Charlize Theron, star of Monster, but for thirteen-year-old Castle-Hughes, being in Los Angeles, appearing on the Tonight Show with Jay Leno and the Oprah Winfrey Show, and attending the Oscar ceremonies provided sufficient excitement to overcome any disappointment. While she enjoyed the hoopla surrounding the Academy Awards, Castle-Hughes, viewing the Hollywood scene for the first time, expressed a hint of skepticism in a February of 2004 article in the New Zealand Herald: "Here it's all based on these awards and these awards and these awards, and if your life doesn't revolve around it, then what are you doing in Los Angeles?" She also expressed amusement regarding the numerous gift baskets she received as an Academy Award nominee: "What am I going to do with acid peel and wrinkle remover? And you get all these gift certificates for places in Beverly Hills—I'm like, I live twelve hours away from here." Following her whirlwind tour of the American entertainment industry, Castle-Hughes eagerly returned home to her friends and family, hoping to get back to her normal life but unsure whether that would be possible. In early 2003, just as her fame was spreading from the success of Whale Rider, Castle-Hughes told the New Zealand Herald of her anxieties about enrolling at a new school: "I think it would be nice if I could meet people as me, but that's not going to be possible. I'm going to meet people as 'the whale rider' and it's going to be hard, even as fun as it's going to be. I want to meet people on my own steam." Coping with newfound fame and the changes it brings will continue to be a factor in Castle-Hughes's life; she plays the Queen of Naboo in the upcoming film Star Wars: Episode III, due in 2005. Baillie, Russell. "Keisha's Big Worry, Heels and Red Carpet." New Zealand Herald (February 28, 2004). Bal, Sumeet. "Keisha Castle-Hughes: Whale Rider. " Entertainment Weekly (February 6, 2004): p. 50. Black, Eleanor. "Taking Rider in Her Stride." New Zealand Herald (January 25, 2003). Engberg, Gillian. " The Whale Rider. " Booklist (July 2003): p. 1881. Linden, Sheri. " Whale Rider. " Hollywood Reporter (June 6, 2003): p. 25. Sorensen, Marlene. "New Zealand Girl Power." Time International (August 11, 2003): p. 58. "Keisha Castle-Hughes: Pai." Whale Rider: The Movie. http://www.whaleriderthemovie.com/html/castcrew_cast.html (accessed on April 29, 2004).